Every month we will be sharing a photograph of a place in France. 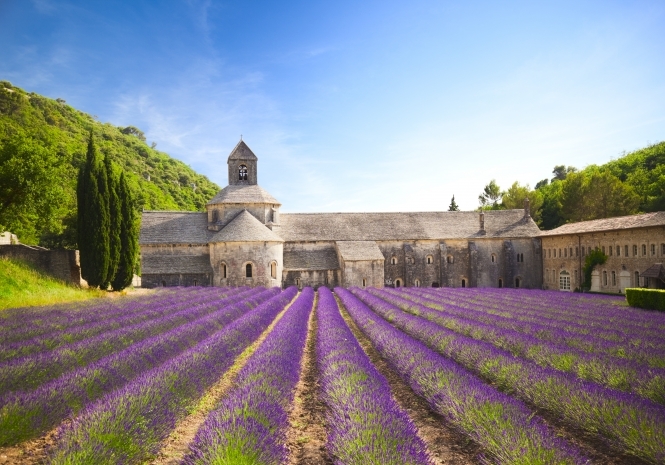 This month we take a look at the Abbaye de Sénanque in Vaucluse, Provence. If Abbaye de Senanque, the Cistercian abbey near Gordes in Vaucluse, appears to be a clichéd image of idyllic Provence, then so be it. It is universally lauded as a near-perfect vision of lavender field loveliness. Built in 1148, Sénanque reached the peak of its influence in the 13th and 14th centuries, when it operated four mills, seven barns and possessed large estates around Provence. During the French Revolution, the abbey’s lands were nationalised and the solitary remaining monk expelled. It was rebought in 1854 for monks and the current inhabitants have been here since 1988. After filling your camera’s memory card with dreamy shots of the 1148 building’s exterior, you can head inside the monastery, to visit the church, cloister, chapter-hall and dormitory. As a mark of respect for the residents, no photos are allowed, silence is expected and a proper dress code required. Airborne antics with strings attached for all the family at the 32nd running of this huge kite festival on the beach. Kids of all ages will marvel at the creativity and colours on show, as well as the top kite-flying skills.